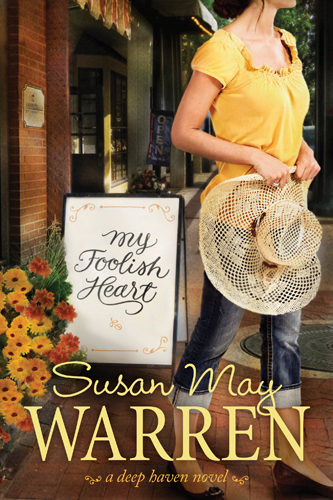 Book Review - "My Foolish Heart"
Susan May Warren's latest novel, "My Foolish Heart," is book #4 in her Deep Haven series. I have not yet read the other 3 books in the series (I need to! ), and I did not feel lost or "out of the loop" while reading this book, so do not think you cannot read this book if you have not read the others! Isadora (Issy) lives in her own little world - specifically her home and yard, as she is fearful of having a panic attack in front of the town again. Issy's best friend Lucy keeps her connected to the town and Issy connect with others through her talk radio show "My Foolish Heart;" however no one knows she is the host. Caleb moves in next door to Issy and their paths cross and yet they are both keeping secrets so neither really knows the other person. Caleb is trying to become the head football coach for the high school as the longtime coach, Issy's father, has been unable to coach since the accident, yet Caleb has some limitations of his own including missing part of a leg. Caleb calls into "My Foolish Heart" on a whim as he is trying to get on better terms with his neighbor and Issy shares advice not knowing that she is the one who is the focus of the coversation! This is a great book and I highly recommend it! Warren's town of Deep Haven is a cute, touristy town, but yet has the small, hometown feel as well. The characters are so lovable and ones that the reader will want to spend more time with! I am for sure going to now go and read books 1-3 to learn more about the minor characters in this book! Issy, Caleb, Lucy and Seb are all dealing with individual issues in their lives and they each must work through them and through this they become closer to God, with each other and who they each would like to be as a person. The role the dog plays is sweet and significant as he provides companionship, comfort and plays a role in bringing two people together and also helping them find healing in their own lives. This is a fun, encouraging and touching read that will have you drawn into the lives of Deep Haven residents in the first chapter! Book Review - "Double Take"
So often another person's life is so enticing and you wish to be that person and have his or her life. This is what two girls from completely different worlds think until they get to chance to switch places in Melody Carlson's new youth adult fiction novel, "Double Take." Madison Van Buren, from one of the wealthiest families, is fed up with her life and being pulled in all directions. It is her spring break and she just heads out leaving New York City and ends up in Amish country. While at a diner she meets up with an Amish girl her age and who could pass as her twin. Anna, the Amish girl, is waiting for her uncle to pick her up to take to their home to help her pregnant aunt. The two girls switch clothes and identities and decide to meet and switch back in a week. Anna arrives at Madison's penthouse and begins a search for former Amish beau who had left for the city about a year ago and Madison is thrust into having to care for children and an Amish household. Neither girl is truly prepared for all of the experiences and soon realize there are aspects of their lives that they miss. This is a fun book to read! It is a great illustration of being grateful for who you are and your life and that things may not always be greener on the other side. I enjoyed reading about the girls' experiences during their switch and experiencing along with them the changes and growth they each made. The relationship that Madison makes with Aunt Rachel is great and beneficial for both of them as is Anna's friendship with Lucinda. It is a great story of looking beyond the surface and appreciating life. I highly recommend this book for young adults and older adults as well! Book Review - "The Thirteenth Gift"
"The Thirteenth Gift" is a beautifully written story by Charlene Costanzo. Claire, a traveling journalist, witnesses and reports on the hurting, abused and living in poverty children throughout the world. Claire meets an elderly woman, Baba, and a fable is shared about "gifts" that were brought from twelve godmothers for a king and queen daughters. These gifts are not traditional gifts as they include beauty, wisdom and imagination just to name a few. As Claire learns of these gifts she also learns to appreciate them and apply them to her own life, thus making changes in her own life. This is a well-written story that will make the reader think about his or her own life and any changes that should be made. This is a quick read, yet one that is thought-provoking as well. Book Review - "The Inconvenient Marriage of Charlotte Beck"
Kathleen Y'Barbo's 40th book, "The Inconvenient Marriage of Charlotte Beck," is sure to delight readers! Charlotte is bucking the treand and normal societal expectations for young women in the 1880's as she wishes to remain single, go to college, earn a degree and work with her father in their family company. However, her father is not in agreement with that and would like to see her in a nice marriage. Charlotte's father meets Alex, an astronomer and formulates a plan that will solve all of their problems, Alex's family name will be saved, Charlotte will be able to attend college and Charlotte and Alex will be married. Charlotte and Alex are not in total agreement with this as they plan to have the marriage annulled, but suddenly this does not become the plan. Y'Barbo has created a fun read! Charlotte's stubbornness and her spirit come alive on the pages and she is a loveable character that you will enjoy getting to know and reading about! The character's interactions are humorous and yet touching at times as well and the characters will have you drawn into their lives and keep you there from the beginning of the story to the end. A great, fun read for this summer! Book Review - "To Win Her Heart"
"To Win Her Heart" by Karen Witemeyer is a great historical fiction read! This is Witemeyer's third novel, yet it is the first one that I had read, but it will not be the last! Eden Spencer has resigned herself to being a spinster as the man she was engaged to did not really love her, instead he loved her father's money. Eden moved to Spencer, Texas, the town founded by her father and lives in her parents' home. Eden fills her time with operating a library out of the home and leading a story hour for the children. Eden meets Levi Grant, the town's new blacksmith and is puzzled and intrigued by the hours he spends reading at the library. Eden cannot believe that this man is a fan of books and enjoys the stories as she does. Eden and Levi begin corresponding through letters and through Levi's actions - not fighting when provoked, rescuing a kitchen girl from the local saloon and bringing her to live with Eden - Eden finds herself falling in love. However, she is not prepared when she learns of Levi's past. I really enjoyed this story! Witemeyer created lovable characters. Chloe plays a wonderful role in the story and Eden's parents, although they are not a huge part of the story, play vital roles as well. The descriptions and imagery throughout the book are so vivid and well-written. Eden's hobby of pressing wildflowers and making wall hangings with them was fun to read about. Book Review - "Chasing Sunsets"
Eva Marie Everson has started a Cedar Key series, the first book being "Chasing Sunsets." A great summery read that will transport you to a Florida beach! Kimberly does not know what she did to have her husband divorce her, but he did and now he has 5 weeks of visitation with their 2 sons this summer. Kimberly's father sends her to the family beach house to find a new housekeeper, however Kimberly finds healing, a past love, a new friend, and truths that have been covered. As soon as Kimberly enters Cedar Key she can feel some of the tension leave her and she is transported back in time to when she was young and carefree and vacationing with her father. Kimberly meets up with Steven, a local boy who she lost her heart to in high school and also had her heart broken by. Following her heart instead of her head, Kimberly agrees to go out with him and they share about their lives since that summer years ago and discover that there may still be love between them. This is a beautiful story of second chances and relationships of all kinds. I love how Everson ties in flashbacks and memories throughout the story as it allows the reader to relive these moments along with the characters. Kimberly is dealing with a lot at this time as she is still coming to terms with her divorce and having her sons away from her, but she is also having to deal with issues from the past such as her mom's drinking problem and current issues in her sisters' lives as well. Kimberly is such a believable character and one the reader will come to love and empathize with. I am looking forward to reading the second book in this series, "Seeking Sunrise." There is a sneak peak at the end of "Chasing Sunsets!" Book Review - "Utopia Texas"
Betty Byrd shares a captivating story, "Utopia Texas," that looks at what people will do to have wealth and status in society. Brya's position in society is everything to her and she will do whatever to keep her station in life even if it destroys her relationship with other. Brya's relationship with her daughter Olivia has always been rocky and she will go to any lengths to cover up the "mistakes" that Olivia makes, no matter the cost. Brya and Cole, her husband, are part of the elite crowd and part of the oil business in Texas and wherever they go with Olivia, something happens as Olivia seems to cause trouble for them and her friends. This does not end even as Olivia becomes older and Brya finds herself caring for her granddaughter Maggie and helping to rear her as Olivia is "unfit." The book cover will draw the reader to pick up this story and begin reading - great choice for the cover design! This is an interesting read that really delves into relationships with each other and the facades that people feel they must keep at all times and at any cost. The characters are well-developed and Cherese and Plez are great additions to the story. This is Byrd's second novel, a follow-up to her first, "Trinity's Daughter." Book Review - "Desert Gift"
Sally John dives right into the story in her latest novel, "Desert Gift." Marriage expert Jillian Galloway's world is turned upside down when her husband of 24 years tells her he wants a divorce. This announcement is made when she is getting ready to walk out the door to catch a plane to a publicity tour for 5 weeks. Jillian questions herself, her career, everything about her and wonders what she could have done differently. During this difficult time Jillian seeks refuge at her parents' home in the desert and really seeks God during this time and learns more about herself. If you are looking for a light summer read, this is not it! This book is thought-provoking and will have you thinking about your own life and different twists and turns that may have happened. John has created very real characters and you will empathize, question and grow along with Jillian throughout this book. John's style of writing is easy to get into you and read and you will be hooked on the very first page! Book Review - "A Vision of Lucy"
"A Vision of Lucy" is Margaret Brownley's third book in her Rocky Creek Romance series. This is a great addition to the series! I really enjoyed the story! Lucy loves photography and she wishes her father would accept her as a photographer and see her as an artist like he viewed Lucy's mother. However, things do not go smoothly for Lucy, she appears to be accident-prone as things continually happen wherever she is! Lucy meets David, a quiet rustic man and soon discovers that he has secrets. By taking his picture, Lucy believes this will be the key to her acceptance; however things are not always as they seem. Brownley does a great job at pulling the reader into her story. The characters are very fun and lovable, and could be the people living in your town. The historical aspect and descriptions are vivid and transport back in time to Rocky Creek! 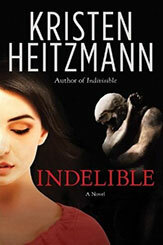 Kristen Heitzmann's latest novel, "Indelible" is a thrilling read that grips you on the very first page and does not let go until you reach the final page. It is filled with romance, suspense, hope and healing. Natalie Reeves is a sculptor, however she is not a "normal sculptor" as she has a disability that she must cope with by releasing images through her hands into the clay. While moving into a new town with the help of her pro-athlete brother and his family, a horrific incident occurs and this results in Natalie meeting Trevor who rescues her nephew. Trevor, former Olympic skiing, owns an outfitter shop and is part of a search and rescue team as this helps him to work through things from his past. Natalie and Trevor's lives become intertwined and they find themselves dealing with someone who worships Trevor, but is also harming innocent lives around them. I really enjoyed this book; however I did not realize that this book is part of a series until I was partway through. I felt like I was missing bits and pieces through the story as other characters and past incidents were referred to. I searched on the Internet and found that Heitzmann's novel, "Indivisible" comes ahead of this one and I am now going to read that. I do wish I had read it first, but the story is great either way. The characters are well-developed in this novel and there is a small town community feel while reading about their lives. I hope this town and these characters are a part of future novels from Heitzmann. Book Review - "Money Secrets of the Amish"
"Money Secrets of the Amish" by Lorilee Craker is a fascinating read! The Amish live so simply and are often looked upon as living in the past or in a world so different than ours; however they are living in today's society and are still managing to survive, thrive and save money! The stories that are shared in this book are about real people who are living in today's society and making choices that result in having plenty to live on and also managing to save for the future as well. There are many tips that can be applied to an "English" life and many things to think about. It will encourage each reader to think about where money is being spent and how to live more carefully. This is a great read for today! * I received a complimentary copy of this book in exchange for a honest review.